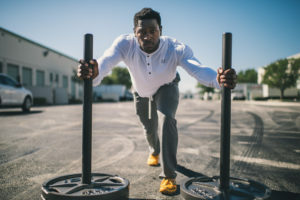 Workouts That Really Work: Why You Should Be Using Primary Pattern Programming - Welcome To Staley Strategies Online Fitness Coaching! 2) Most people who train with weights want workouts that are maximally efficient, as well as maximally effective. If your training goals are different than what I just listed, PPP may not be what you’re looking for — for example your primary goals might be more centered around injury prevention/rehab, athleticism, and/or developing other fitness traits such as cardiovascular capacity or mobility. One other qualifier before we we dig deeper into this topic: PPP is not a periodization format — instead, it can be integrated into almost any popular periodization scheme, including linear and DUP (daily undulating periodization) styles. PPP at its essence, is a strategy for populating exercises into weekly training cycles. The most efficient and effective workouts are those that address the maximum amount of muscle, with the fewest number of exercises, with the least amount of redundancy. In my experience, I’ve found that the best way to accomplish those ends is to think about exercises in terms of movement patterns, rather than muscles. Over the years, various experts have identified several different “primary” or fundamental movement patterns, which include everything from vertical and horizontal pushing, vertical and horizontal pulling, squatting, hinging, rotation, lunging, and gait, just to name some of the best-known examples. I certainly recognize the value of these exercises for specific contexts, and for that reason, PPP workouts allow for up to 2 “secondary” exercises per workout (these secondary movements are considered “optional,” and to be done after the 4 “compulsory” primary pattern exercises). The reason these exercises are both secondary and optional is that, compared to primary pattern exercises, secondary exercises train fewer muscles, smaller muscles, and tend to impose less homeostatic disruption. Notice that you could have a gym full of people, all doing PPP workouts, and yet all doing completely different exercises. In fact, the only thing these lifters would have in common is that their workouts are efficient and effective. You’ll only see a minimum of “lesser” movements like curls, tricep pushdowns, and leg extensions. By definition, whenever you train PPP style at least two thirds of your workout will consist of high “bang for your buck” exercises. And if you happen to like movements that I consider to be “irrational” for the purposes of maximally-efficient strength and muscle acquisition (power cleans, box jumps, crunches, get ups, tricep kickbacks, and curls, just to name a few), you’ll be happy to know you can still do them. And yes, I do realize that many of these movements are in fact good choices for many people, despite my overall objections to them, which is why I’ve designated the “secondary” exercise category. 1) Circuit training tends to be much more time-efficient than a station training approach — meaning, you can perform more total work in less time. 2) Circuit training has more cardiovascular benefit than station training. 3) Circuit training prevents you from giving the lion’s share of your energy to your favorite exercise or muscle group. This not only facilitates a more balanced physique and strength profile, it also reduces the risk of overuse injury. As a simple example, I can’t even begin to tell you how often I’ve consulted to male clients who had bench-press -induced shoulder issues over the years. Nearly all of these guys managed to correct these problems by doing the bench press as the last exercise of the workout, as opposed to the first. Now sure, if you bench at the end of your workout, you won’t be as strong as compared to benching at the beginning of your session, but hear me out — that’s a good thing when you have shoulder pain! And needless to say, you’ll bench more weight with pain-free shoulders at the end of your workout than you will with painful shoulders at the beginning of the session, right? Bottom line — a large proportion of exercise-specific orthopedic pain isn’t the fault of the exercise itself, but rather, spending too much time, too much energy and using too much weight (and often, cutting corners in order to use that much weight) on that exercise. When you train in circuits, every exercise you do receives equal time, attention, and energy. This doesn’t solve all injury issues, but you’d be surprised how often I’ve used it to save my clients from time-consuming and expensive doctor and physical therapy visits. I’ve anticipated your most likely questions concerning PPP, which I’ve answered below. That being said, if you still have questions about this system of training, please post them in the comments section below. Q: How many sets/reps should I use? A: This depends on your primary training goal and your individual maximum recoverable volume. That being said, in general, when your training objective is hypertrophy, reps should be in the 8-15 range for most sets, and when strength is your primary goal, reps should usually stay in the 1-7 range. Sets/per exercise/per workout will typically be between 3-6. Q: What if it’s difficult or impossible to use circuit training in my gym? A: The next best option is to do your 4 primary movements in pairings — for example, complete all working sets for your squat and push movements, followed by all sets of your hinge and pull drills, and finally, if you’re using secondary exercises (remember — these are optional) finish up with that. If you simply must train station-style, do so, but I recommend you change the your exercise order from workout to workout. Q: What about (list your favorite exercise here that doesn’t fit in any of the 4 primary pattern categories)? A: Do them as secondary exercises. Q: I have a question about warmups — I need more warmup sets for some exercises (like deadlifts for example) than for others. So should I do all my warmups in a circuit also, or get a “head start” on the exercises that need more warming up? A: Both methods are acceptable, and each has its distinct benefits and drawbacks. During a recent workout, I did barbell squats, flat dumbbell bench presses, weighted back extensions, pullups, and standing dumbbell curls. I needed no warmup sets for the pullups, and back extensions, but I did need warmup sets for the dumbbell benches and squats. In this session, I simply did every warmup and work set circuit style, which meant I finished the pullups, and back extensions first, followed by dumbbell benches, and finally squats. By the time I got to my work sets on squats, all of my other work had already been completed. The down side of this was that I was probably fairly fatigued by the time I got to my heaviest sets of squats, but the upside was that I was thoroughly warmed up. If, on the other hand, I had decided to get a head start on my squat warmups, I would have been less fatigued, but also less warmed up for my squat work sets. As long as you understand these trade offs, you’ll be able to make the best decisions for your own workouts. Q: Can I do the same exercise for each category every workout, rather than (for example) using a different squat movement each workout? A: You can — this is a good strategy when you’re trying to improve your strength on a specific exercise, like the bench press for example. However, when overall muscle mass and body composition is the main goal, it’s probably better to use maximum variety in your exercise choices. Q: I have a specific warmup/activation/prehab routine that I really like — can I continue to use it with PPP? Q: I’m a weightlifter (as in Olympic weightlifting) — how might I use PPP in my training? Q: Earlier you mentioned that PPP could be used with dedicated workouts for upper or lower body — how would that work? Q: Where can I learn more about PPP?